Here's what we all know about Kanye West: He's a six-time Grammy Award winner, a rapper and producer par excellence, and a rockin' cinematographer. 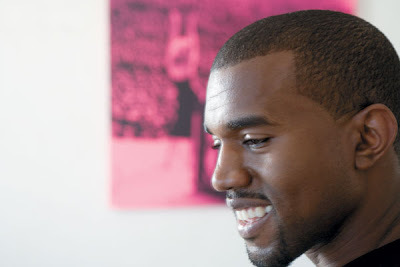 He survived a near-death accident five years ago and, in thanks, gave the world "Through the Wire." He's engaged to Alexis Phifer, whose dress collection Ghita will appear at New York's upcoming fashion week. Here's news to us: West studied fine art at the American Academy of Art in Chicago on scholarship. He collects pop art. And he absolutely adores design. "It's been my dream to be in Interior Design." With that unsolicited introduction, he steps into his Los Angeles house for a portrait session, fresh off a transatlantic flight from the Concert for Diana. Without missing a beat, he's ready to pull out his laptop to preview a music video in the works with Takashi Murakami, then talk renovation with Desiderata Design principal Don Stewart. 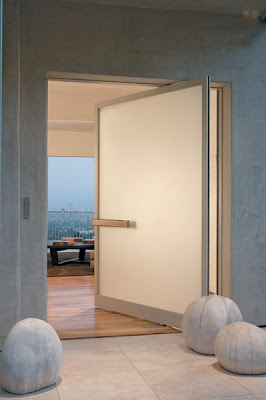 Photography by Art Gray The front door of aluminum-framed sandblasted glass is preceded by Jo Ann Patterson's hand-coiled ceramics. Given his celeb stature, West's home is surprisingly restrained—the furthest thing imaginable from MTV Cribs. Built on spec, the 4,200-square-foot, three-level house started out as a beige stucco monolith. Inside were blond maple floors, an immense black granite fireplace taking up a wall in the living room, more granite in the kitchen, and random soffits all over. "Kanye loved the newness and the city views," Stewart recalls. When West purchased the property, he was initially looking only for furnishings. That phase was short-lived. "Kanye started to realize how into design he is," Stewart continues. "Staying at the Bulgari in Milan and the Grand Hyatt in Tokyo on tour, he'd come back full of ideas, in touch with his inner minimalist." What West envisioned was a cross between a museum and a Louis Vuitton boutique. The project eventually morphed into a full-fledged renovation, lasting almost three years. 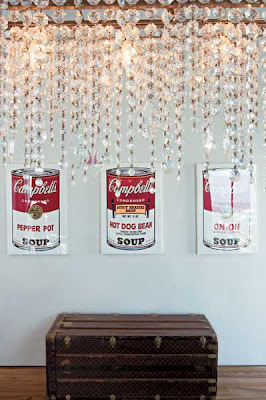 Photography by Art Gray In rapper Kanye West's Los Angeles kitchen, Desiderata Design installed Ivan Lolli and Mario Memmoli's crystal chandelier above Andy Warhol's Campbell's Soup silk screens and an 1870's Louis Vuitton steamer trunk. Out went every vestige of spec. In came enrichment and consistency. Stewart got rid of all those soffits, raised ceilings, finished walls with raw plaster, and swapped out insignificant windows for frameless glass. He gave the top-floor public spaces a loftlike feel, opening up passages between living room, dining room, and kitchen. Designer and client hit upon French walnut for flooring, Stewart says, after "looking at almost every sample in town." Photography by Art Gray At the entry are Jonathan Seliger's Hermes 05 in bronze and automobile paint, a pair of Italian 19th-century carved wood architectural details, and Louis Vuitton suitcases. Flooring is French walnut. The kitchen is definitely dope. West doesn't cook, but he does party, so Stewart made it read lounge. A chandelier's ropes of crystal twinkle above a 10-foot-long stained-oak bar with a stainless-steel counter that slides away to reveal a cooktop and sink. Out in plain sight are West's pop prizes: Campbell's Soup cans by Andy Warhol and a beaming Bob's Big Boy diner mascot by Burton Morris. Photography by Art Gray The kitchen's lacquered cabinet, backlit by miniature xenon lamps, faces Norbert Wangen's bar-island in stainless steel, paired with walnut stools. West began his serious involvement with art in 2004 when he commissioned a painting from Ernie Barnes—they had met, through Barnes's nephew, after the singer's accident. Fully recovered, West decided that his new dining room's ceiling was begging for a Michelangelo moment. Barnes's resulting celebration, A Life Restored, is replete with a kneeling West and an angel swooping down at the room's oak-veneered Marcel Wanders table, surrounded by slim cream-colored chairs. Mariano Fortuny's iconic floor lamp stands in a corner. Photography by Art Gray A Marcel Wanders oak-veneered table sits near a Mariano Fortuny floor lamp in the dining room. West was hooked. 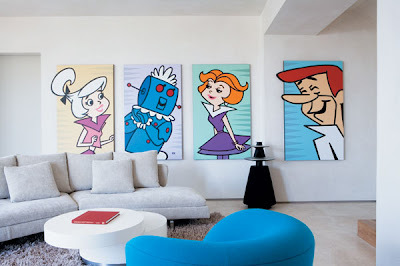 His next commission, far lighter, was a series of six Jetsons "portraits," Morris's pitch-perfect accompaniment to the game room's chair of stuffed animals by Fernando and Humberto Campana and Smurf-blue Igloo chair by Eero Koivisto. Nearby on the house's travertine-floored lowest level, the office/guest room has its own Jetsons-esque touch: a 1970's desk in white acrylic, reflecting pink from a fuchsia silk-screen Marilyn behind. For a mogul-worthy master suite, Stewart blew out walls left and right. 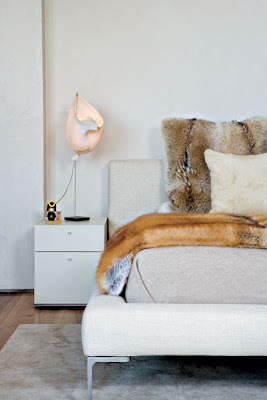 The bedroom is a contemporary showcase, featuring Antonio Citterio's bed—luxed out with red-fox and chinchilla throws—and conchlike Ingo Maurer lamps. 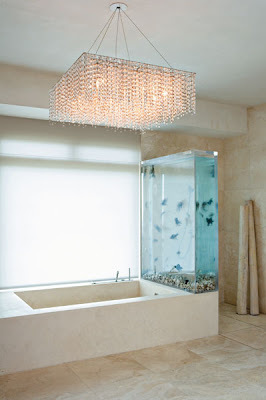 In the master bath, it's all creamy glamour, with another crystal chandelier overhead and more travertine cladding floor, walls, and tub surround. Set at one end of the tub is a 250-gallon aquarium filled with black moor and chocolate oranda goldfish. Across the room, a chair covered in embossed leather and a petrified-wood side table pick up on the nature thread. But these two rooms pale in comparison to the suite's showstopper, West's closet. Who wouldn't bow down before 8-foot-high sliding racks for almost 200 pairs of kicks? Elsewhere, the fashion connection is less Air Jordan, more Vuitton. In the kitchen is an 1870's steamer trunk. Stacked four high, just past the entry, are suitcases from a recent special-order collection. In the living room beyond, Vuitton darling Murakami is introduced via a canvas almost 6 feet square. Sure, the black and white skulls on the blood-red background appear macabre on first view. But gaze closely at those eyes. Their lighthearted flower motif is a Murakami trademark—and it shows up again in the playful pillows spread out in the office below. "In the past year and a half, I've been stepping up my relationship with Murakami," West says. Involvement goes far beyond the music video. Those fortunate to have attended West's 30th-birthday bash—at Vuitton's New York flagship—should have framed the invitation. Yes, it was a Murakami. West is currently designing a mega-bling medallion with. . .Murakami again. And Murakami is responsible for the covers of all the singles on West's album Graduation. Photography by Art Gray In the office, a Charles and Ray Eames chair with custom-colored leather pulls up to a 1970's acrylic desk by Maurice Calka. The pillows are by Murakami. Photography by Art Gray Travertine on the floor, walls, and tub surround. Photography by Art Gray The master bedroom's Citterio bed, Ingo Maurer lamp, and silk rug. 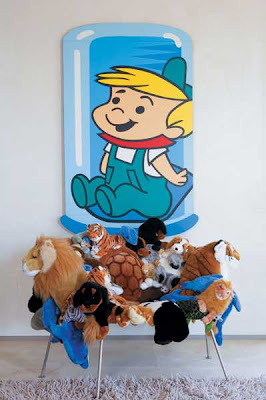 Photography by Art Gray In the game room, Fernando and Humberto Campana's stuffed-animal chair backs up to Morris's Elroy. Photography by Art Gray Morris's Jetsons acrylics hang in the game room, outfitted with Citterio's sofa, Eero Koivisto's chair, and travertine flooring. 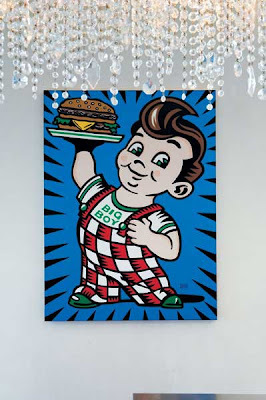 Photography by Art Gray Burton Morris's acrylic on canvas Big Boy is in the kitchen. Photography by Art Gray West stands near Russell Young's silk screen Marilyn in the office.